Tribal heart tattoo designs which are small in size are suitable for ladies. 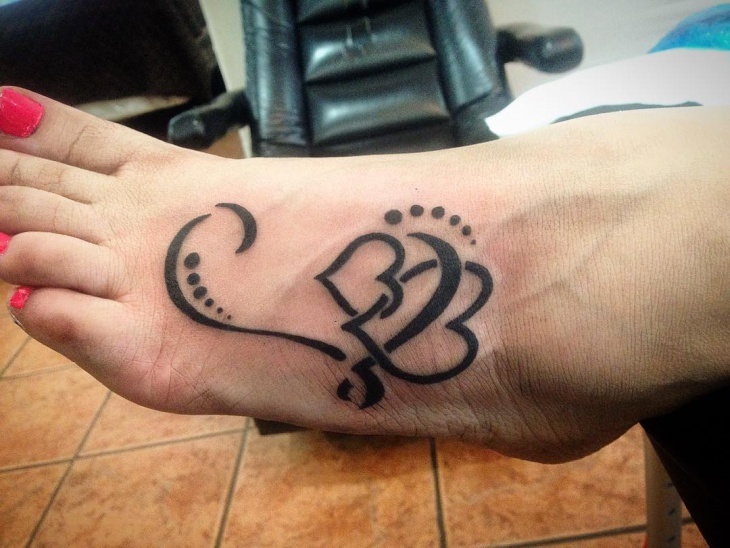 The heart is a powerful symbol of love and this tattoo is well designed on top of the foot. This tribal design featuring a wolf is not only eye-catching but also signifies a noble warrior in the Native American culture. 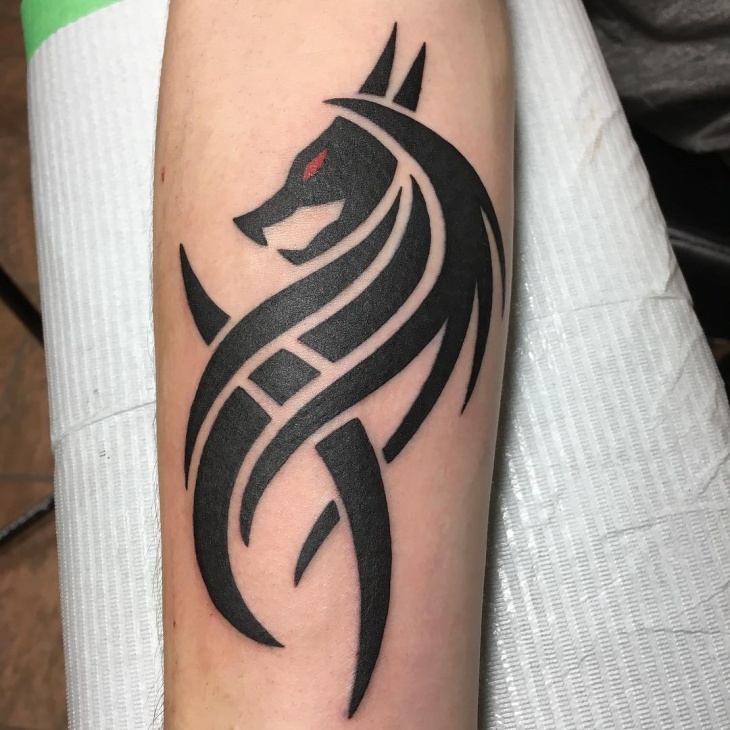 This tattoo shows a wolf howling and it represents good communication. 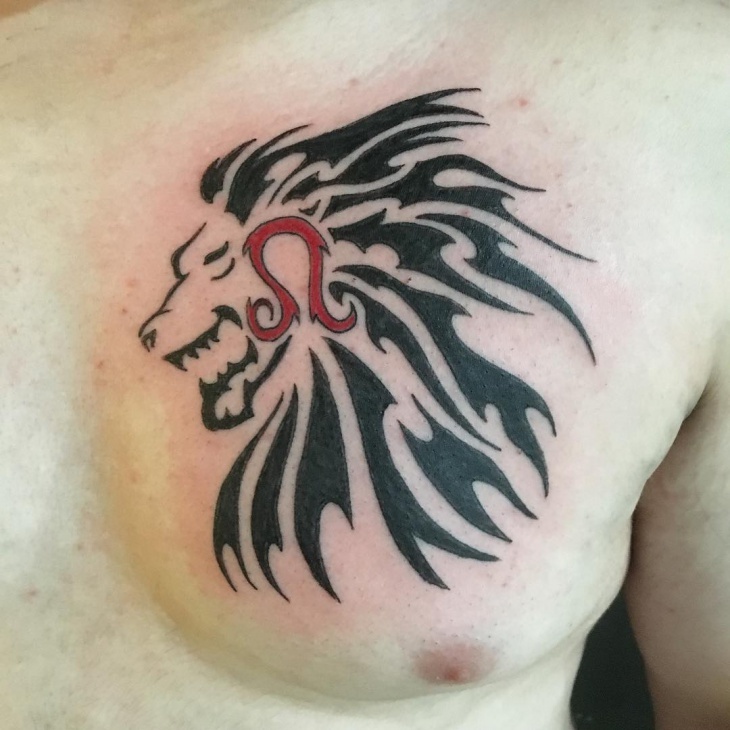 With symbolic meanings such as honor, ferocity, courage and royalty, this lion tribal tattoo design is interesting and looks fantastic. 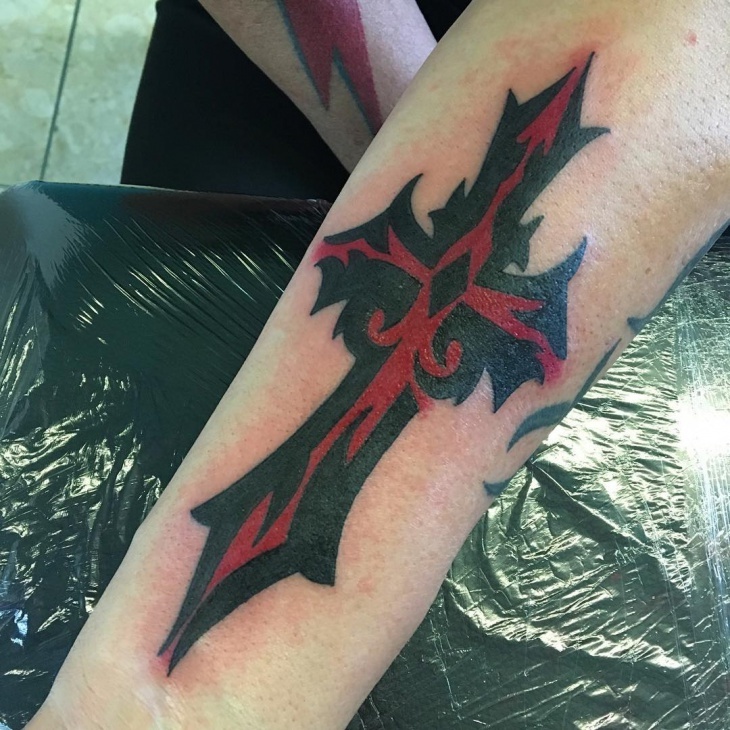 It features black and red ink which makes the chest of the wearer unique. This Hawaiian tattoo design gives an authentic feeling of the deep culture and heritage of this exotic island. It uses brown, black and gray ink colors and features more than five different patterns. In most cultures, a turtle represents wisdom, longevity, good health and patience. Suitable for men, this tattoo features dark black shadings. This tribal cross tattoo design is on the arm and will look good on both male and females. This crucifix mixes black and red color to make the design gorgeous. Men who need to enhance the beauty of their chest can do so by using good looking tribal tattoo designs. 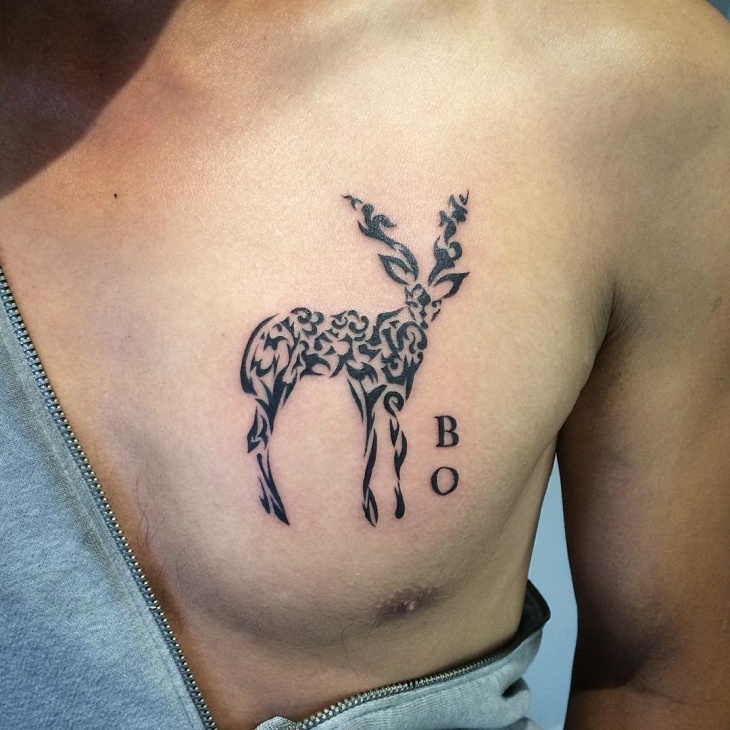 In this the individual has a deer tattooed up in a beautiful swirl pattern in tribal theme. Celtic tribal tattoo designs tend to feature other colors rather than the traditional black ink. 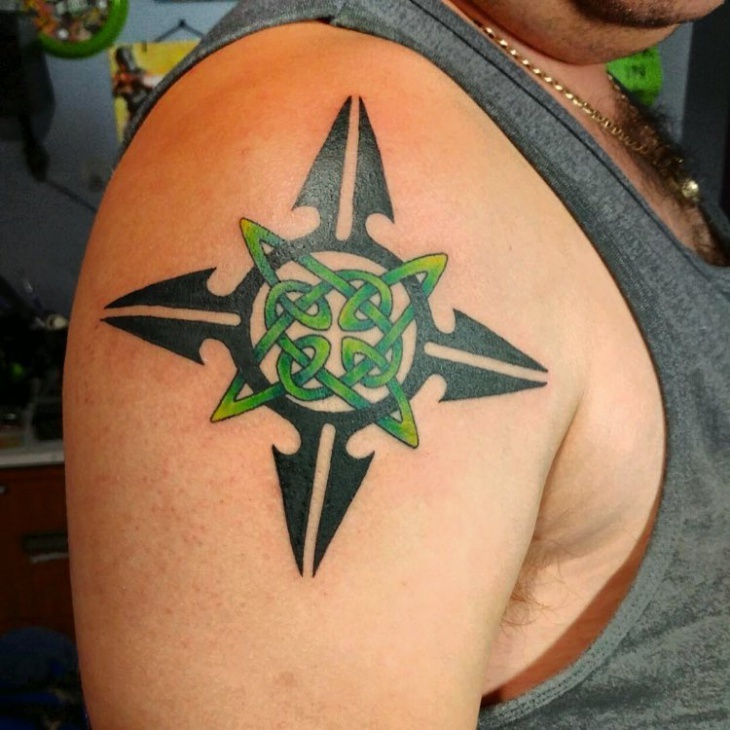 In this Celtic green and black design, the loops are interconnected to give an eternity meaning. Most tribal tattoo designs are large hence tend to look good on a spacious body part such as the back and arms. 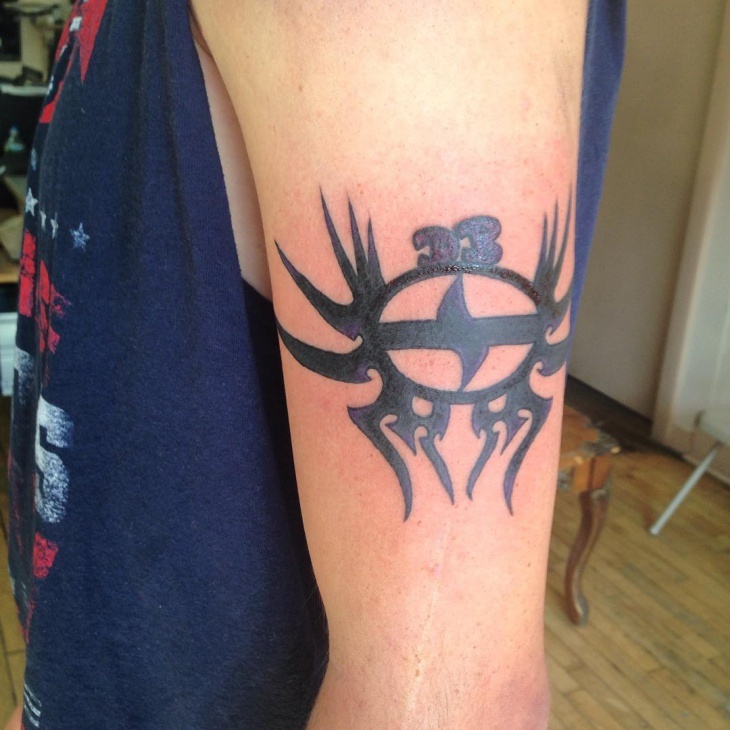 This tribal design includes a date which makes it ideal as a memorial tattoo. 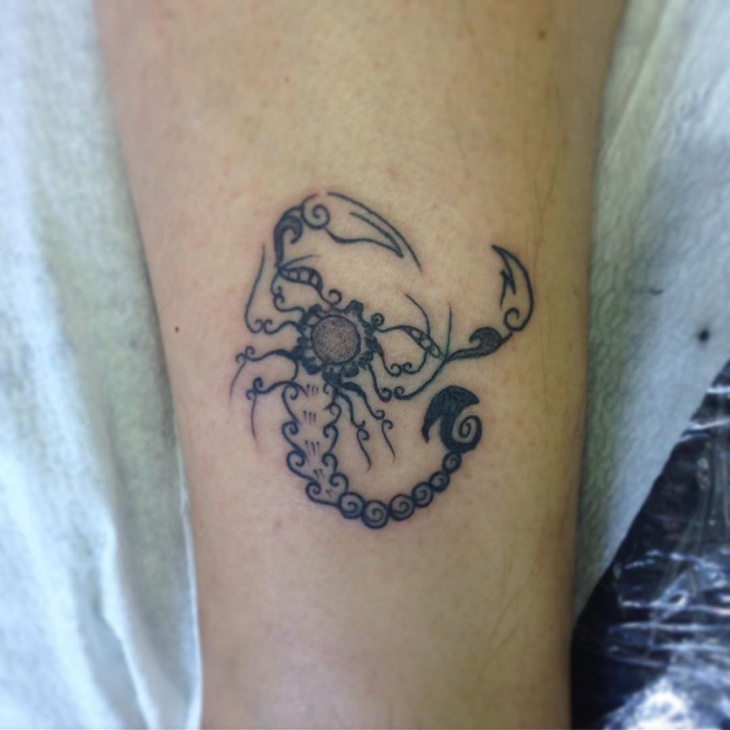 People tend to go for tribal scorpion tattoo design when they need to show that they can defend themselves against any attackers. Simple and small in size this design is unisex. 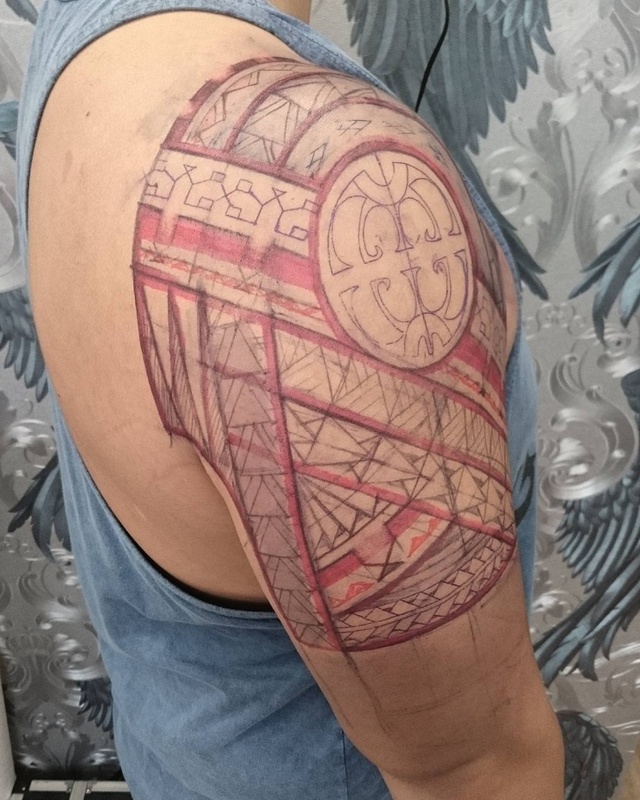 This tribal tattoo design runs high on the shoulder. It mixes red and gray ink colors as well as thick and thin lines to create a beautiful pattern that is suitable for men. Women who are looking for a subtle body art can go for this small tribal tattoo design. 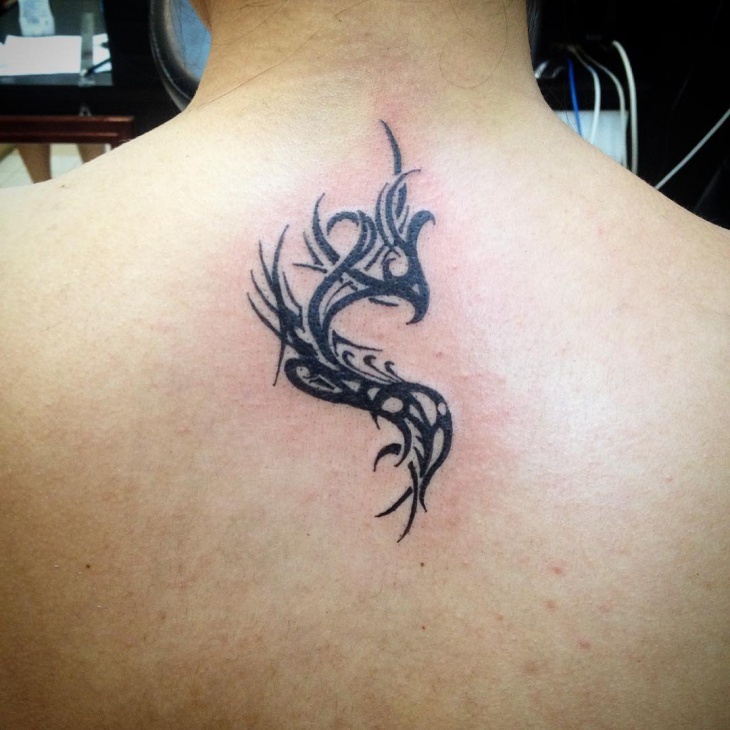 It’s inked on the back using black ink only yet forms a design that is feminine. 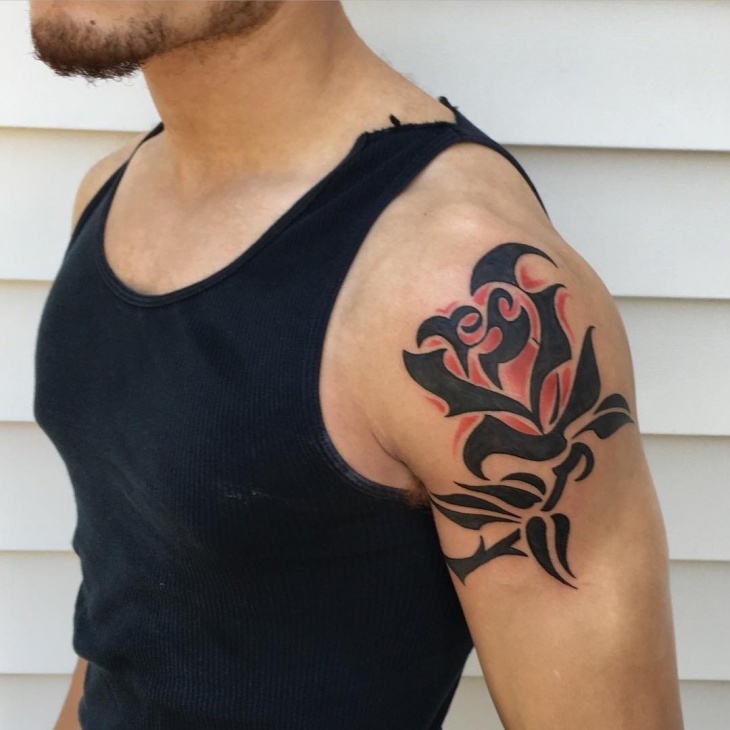 While colored flowers tend to give a feminine trait, this tribal rose tattoo design will look good even on men. The red color on the petals further helps this tattoo to stand out. Even though an eagle is a predator, this majestic bird is also a symbol of power and strength. The wings are stretched on this tribal tattoo design to show freedom and ready for change. 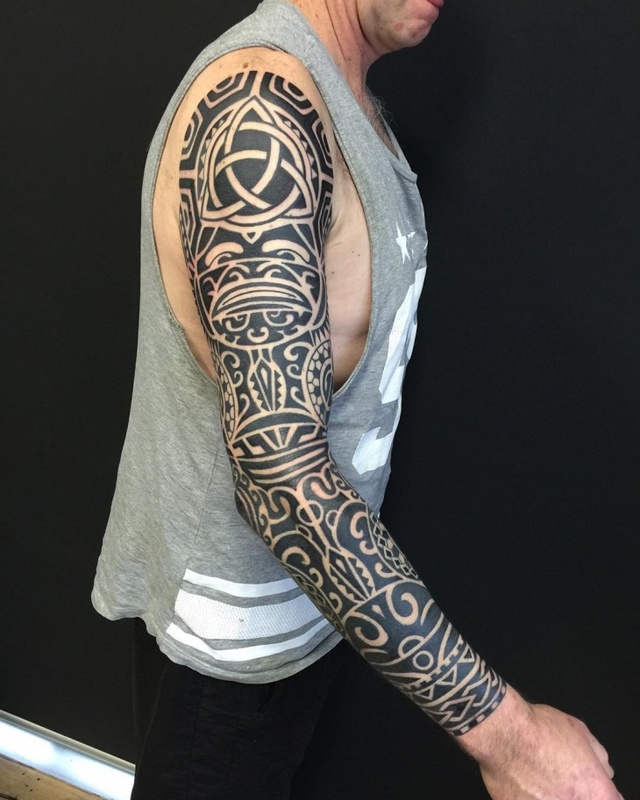 This full sleeve tribal tattoo design incorporates bold outlines and about seven different Polynesian patterns which blend harmoniously to form a gorgeous work of art. Do you believe in astrology? Is Aries your zodiac sign? 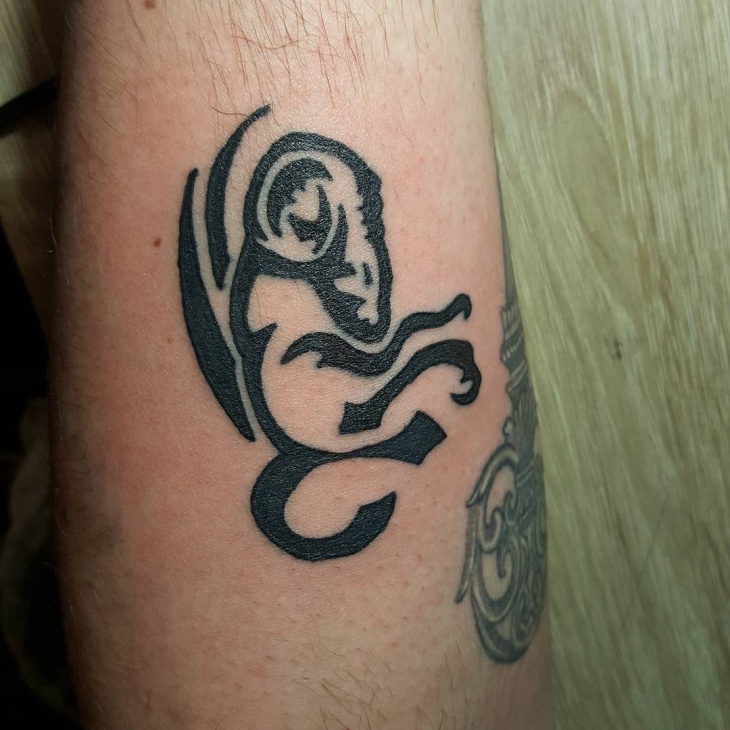 If the answer is yes, then this tribal Aries tattoo design will look good on you. The black ink color is perfect for all skin tones. 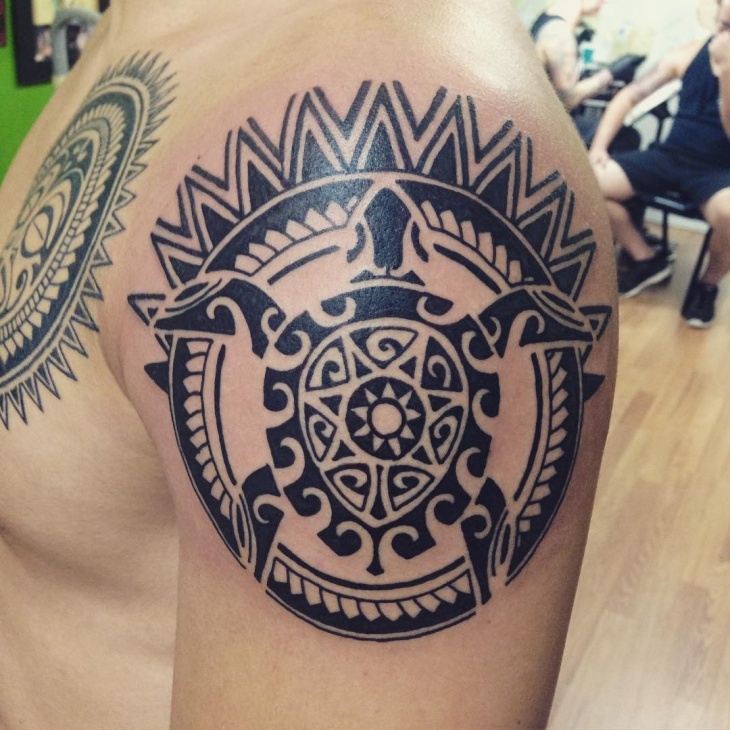 When it comes to choosing traditional Polynesian symbols, the sun is integrated into many tribal tattoo designs. 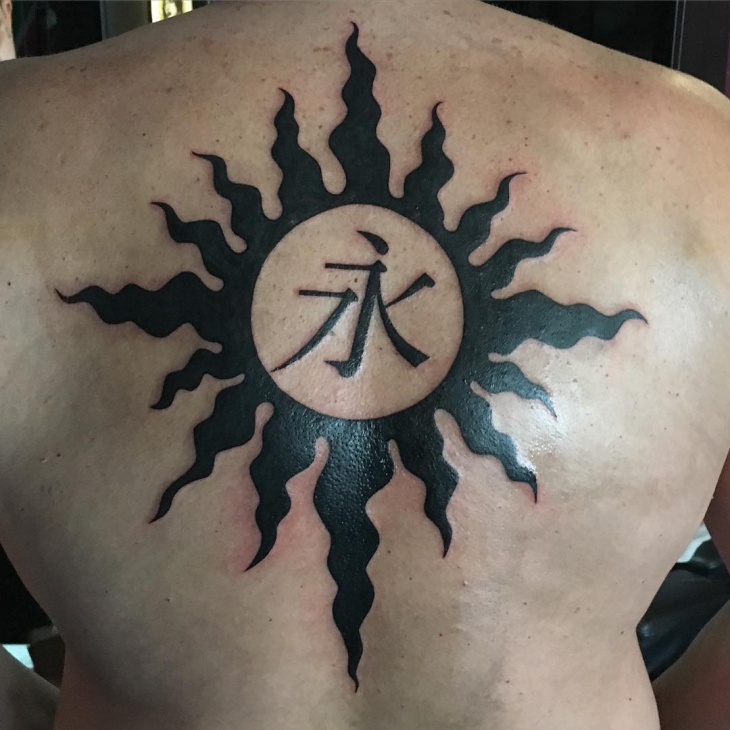 The Chinese symbol helps to personalize this tribal sun tattoo design. This tribal wing tattoo design is to honor and remember the life of a female loved one who has passed away. 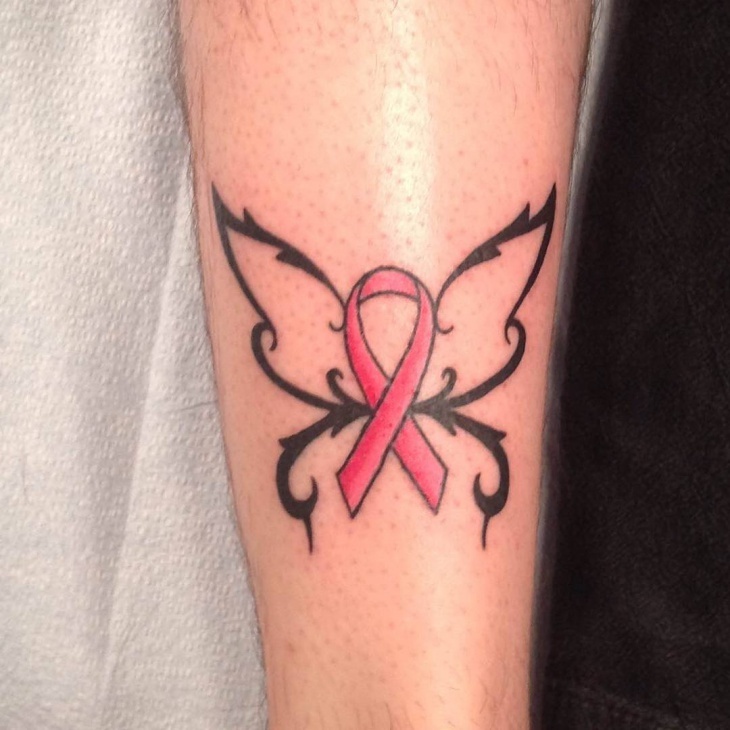 It features a pink ribbon and will look spectacular on girls and guys. Aztec tribal tattoo designs are suitable for people who love expressing their personality in a creative way. 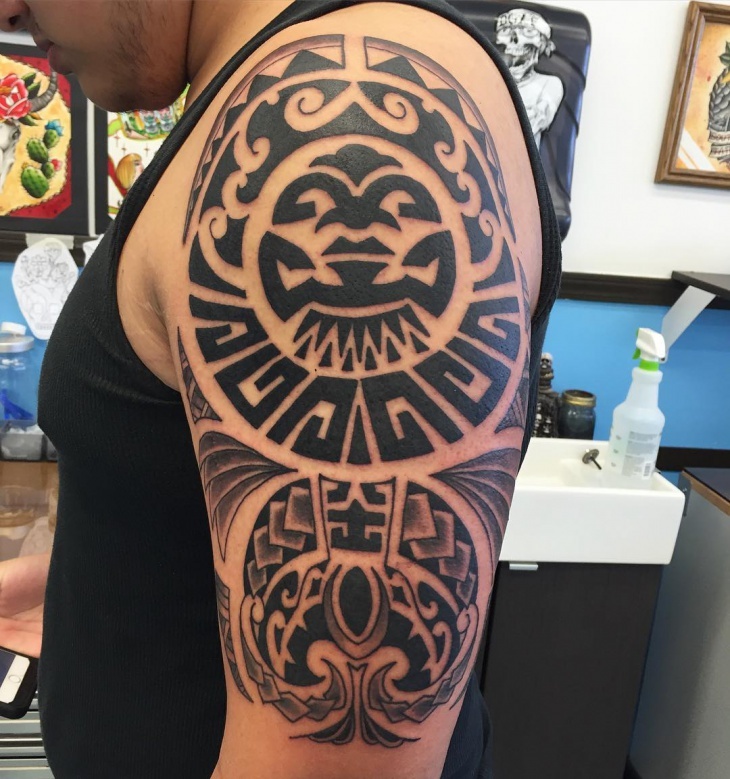 This Aztec tattoo design combines unique patterns and bold shapes using black and gray ink. 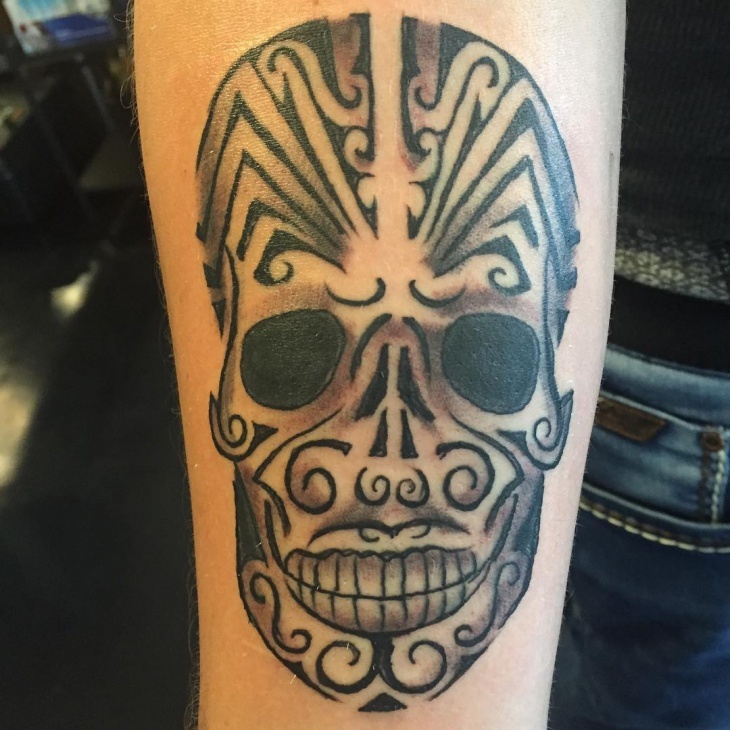 When you need to express how you overcame a challenging life obstacle, then go for this tribal skull tattoo design. The swirl patterns and bold lines make the skull attractive yet spooky. How Tribal Tattoos are Different? 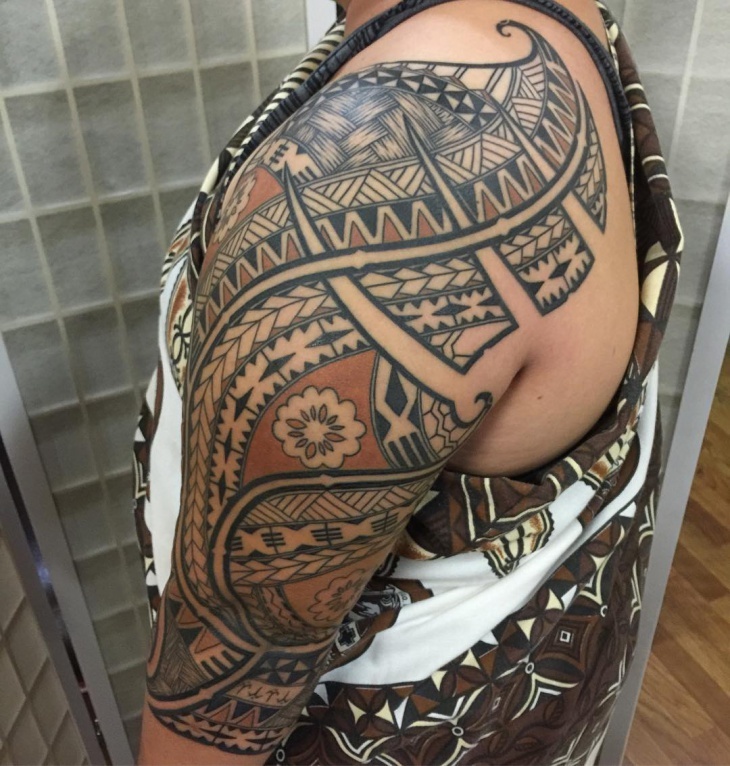 Tribal tattoos get their designs from Polynesian, Maori, Hawaiian, Samoan and Aztec culture. 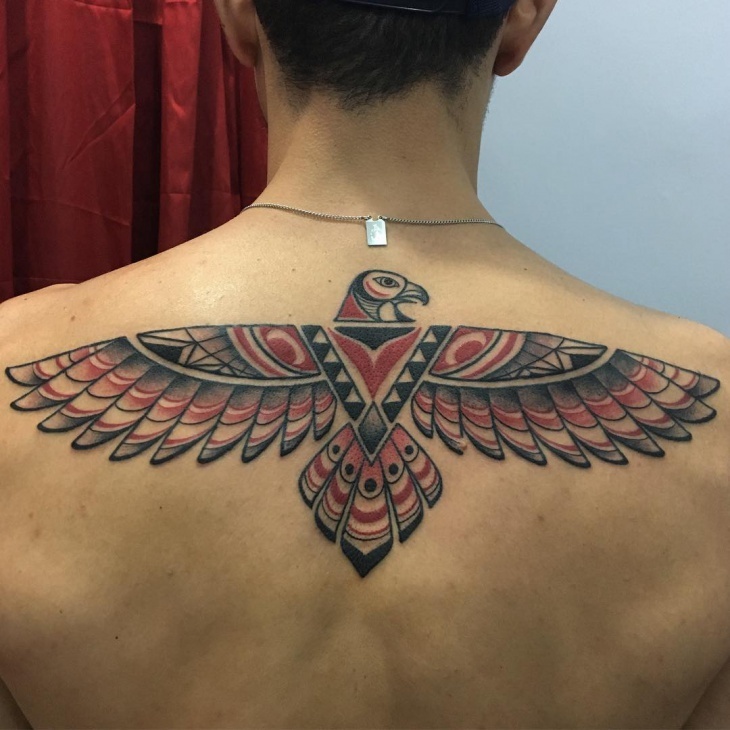 You can differentiate tribal tattoos by their thick bold lines, different geometric shapes and also incorporate the sun, turtles, wild animals, dragonfly or mystical creatures such as the phoenix bird. 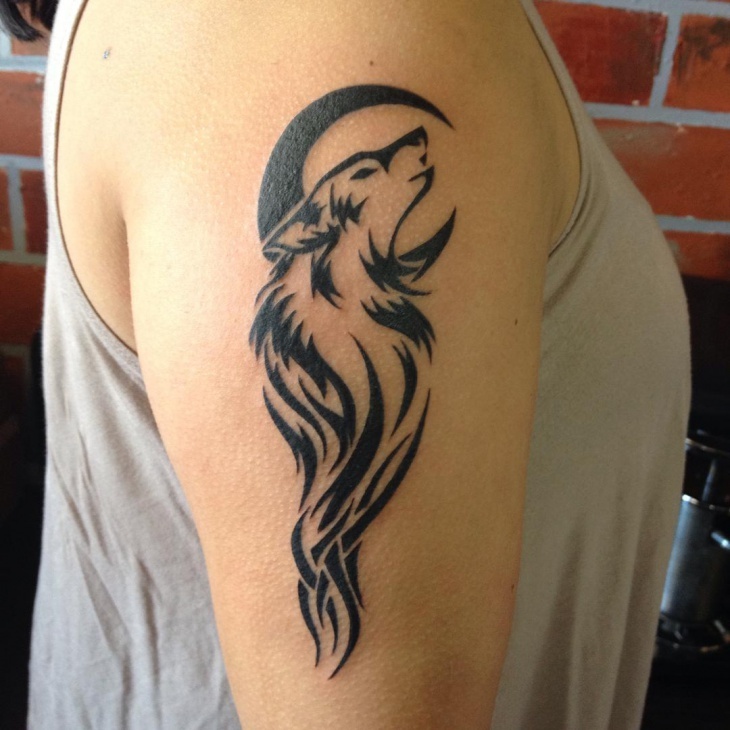 Men tend to go for large animal tribal tattoo designs which are inked either on the back, shoulder, chest or sleeves. Women tend to prefer feminine tribal designs such as heart tribal tattoo design on the foot, back or on the arm. Tribal tattoo designs are unique and feature interesting complex patterns. They mostly use black ink however individuals can also incorporate other colors to depict their passion and creativity. From using a cross, rose flower to Aztec patterns, tribal tattoo design can include any element to ensure that you look attractive.